Chasing the northern lights is notoriously tricky. Hugely increase your chances of spotting them on this guided tour from Saariselkä/Ivalo. 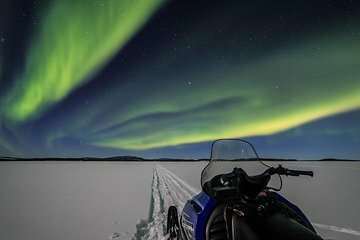 Go off the beaten path, far out of the city and away from light pollution and embark upon a snowmobile-pulled sleigh ride to a frozen lake. After dinner, spend the evening admiring nature's greatest light show before settling in to your cozy cabin. Enjoy breakfast before returning next morning.